There are historical law firms, and then there are law firms founded in 1883. 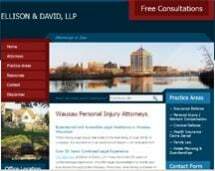 The Wausau Wisconsin law firm of Ellison & David, LLP, has been defending the rights and asserting the interests of residents and visitors throughout the Greater Wausau Metro Area for over 130 years. The firm's litigation and trial attorneys have extensive experience assisting businesses, families and criminal law clients facing difficult situations. With a track record of successful outcomes, the law firm benefits from the respect of our peers and the larger Wisconsin legal community. Our firm's legal philosophy is to assert our client's interests in many different forums. We advise clients early and often on the tradeoffs between various legal strategies, the use of trial versus mediation, and find numerous ways to achieve optimum outcomes. The attorneys at Ellison & David, LLP, uniquely emphasize the need to protect both our clients' immediate futures and their long-term prospects. Our attorneys have over 55 years of combined legal experience that they use to guide individuals and businesses through difficult areas. We help clients facing serious challenges get great results in personal injury, business litigation, family law and criminal law matters. In these areas of the law, legal and personal choices can lead to good or poor outcomes. We take every decision at every stage of the case seriously, and present clients with a range of options. We use a consultative approach to determine what will be best for you and your family. We are a firm of experienced advocates with a compassionate approach. When facing difficult matters, you want a dedicated team of lawyers. At the Ellison & David, LLP, law firm our attorneys set our clients up for a bright future and work to avoid negative outcomes.